Loyola University New Orleans graduate Brennan Peters ‘13 is well on her way to becoming a movie director. Peters, a Loyola English major, received the Jack Kent Cooke Foundation Graduate Arts Award to study film production. Peters is one of only 20 students nationwide who received the award, which funds graduate study up to $50,000 a year for three years in performing arts, visual arts and creative writing. Peters plans to attend the American Film Institute Conservatory in Los Angeles, Calif., where she will pursue her master’s degree in film production with a concentration in directing. Before beginning her graduate film studies, Peters is spending her summer as an intern at the Juvenile Justice Project of Louisiana. 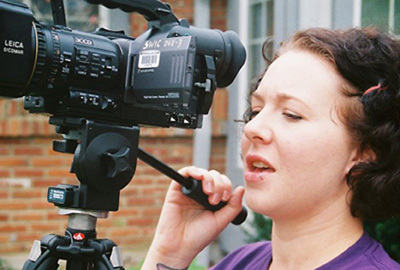 "Brennan has been making thoughtful and challenging films in the English Department for several years, and we're thrilled that she'll be pursuing her filmmaking career in LA with this prestigious fellowship," said English professor and Loyola fellowship adviser Laura Murphy, Ph.D. The Jack Kent Cooke Foundation Graduate Arts Awards support America’s up-and-coming artists from lower-income backgrounds. The foundation, envisioned by self-made billionaire Jack Kent Cooke, awards millions in scholarships and grants each year. If interested in applying for a nationally competitive fellowship such as the Jack Kent Cooke Foundation Graduate Arts Award, contact Murphy.